Rosa Parks v. LaFace Records, et al. was a lawsuit filed in March 1999 on Rosa Parks' behalf against American hip-hop duo OutKast and LaFace Records, claiming that the group had illegally used Rosa Parks' name without her permission for the song "Rosa Parks", the most successful radio single of OutKast's 1998 album Aquemini. The song's chorus, which Parks' legal defense felt was disrespectful to Parks, is as follows: "Ah ha, hush that fuss / Everybody move to the back of the bus / Do you want to bump and slump with us / We the type of people make the club get crunk." The case was dismissed in November 1999 by U.S. District Court Judge Barbara Hackett. In August 2000, Parks hired attorney Johnnie Cochran to help her appeal the district court's decision. Cochran argued that the song did not have First Amendment protection because, although its title carried Parks' name, its lyrics were not about her. However, U.S. District Judge Barbara Hackett upheld OutKast's right to use Parks' name in November 1999, and Parks took the case to the 6th U.S. Circuit Court of Appeals, where some charges were remanded for further trial. In October 2004, U.S. District Judge George Caram Steeh appointed Dennis Archer, a former mayor of Detroit and Michigan Supreme Court justice, as guardian of legal matters for Parks after her family expressed concerns that her caretakers and her lawyer were pursuing the case based on their own financial interests. "My auntie would never, ever go to this length to hurt some young artists trying to make it in the world," Parks' niece Rhea McCauley said in an Associated Press interview. "As a family, our fear is that during her last days Auntie Rosa will be surrounded by strangers trying to make money off of her name." The lawsuit was settled April 15, 2005. In the settlement agreement, OutKast and their producer and recorded labels paid Parks an undisclosed cash settlement and agreed to work with the Rosa and Raymond Parks Institute for Self Development in creating educational programs about the life of Rosa Parks. The record labels and OutKast admitted to no wrongdoing. It is not known whether Parks' legal fees were paid for from her settlement money or by the record companies. The U.S. Supreme Court yesterday cleared the way for civil-rights icon Rosa Parks to proceed with her lawsuit against rap group OutKast over a hit song with her name as its title. The justices let stand a U.S. appeals court ruling that reinstated Parks' claims against OutKast, LaFace Records, Arista Records and BMG. Parks sued in 1999, claiming use of her name without permission constituted false advertising and infringed on her right to publicity. She also claimed it defamed her character and interfered with a business relationship. She had approved a collection of gospel recordings by various artists, released in 1995 and titled "A Tribute to Mrs. Rosa Parks." A federal judge dismissed the lawsuit in 1999, ruling that constitutional free-speech rights under the First Amendment covered the use of Parks' name. The appeals court upheld the dismissal of the claims of defamation and interference with a business relationship, but reinstated the rest of the lawsuit, saying the defendants needed to show some artistic reason for calling the song "Rosa Parks." Attorneys for the defendants appealed to the Supreme Court, saying the appeals court unconstitutionally allowed public figures to use trademark and right-of-publicity laws to censor speech. However, the high court rejected the appeal without comment. 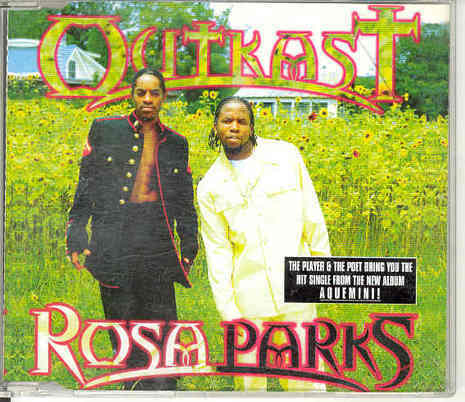 OutKast's "Rosa Parks" peaked at No. 19 on Hot R&B/Hip-Hop Singles & Tracks in 1999. JOHN D. HOLSCHUH, District Judge. This is a dispute over the name of a song. Rosa Parks is a civil rights icon who first gained prominence during the Montgomery, Alabama bus boycott in 1955. She brings suit against LaFace Records, a record producer, and OutKast, a "rap" (or "hip-hop") music duo, as well as several other named affiliates, for using her name as the title of their song, Rosa Parks. Parks contends that Defendants' use of her name constitutes false advertising under � 43(a) of the Lanham Act, 15 U.S.C. � 1125(a), and intrudes on her common law right of publicity under Michigan state law. Defendants argue that they are entitled to summary judgment because Parks has failed to show any violation of the Lanham Act or her right of publicity. Defendants further argue that, even if she has shown such a violation, their First Amendment freedom of artistic expression should be a defense as a matter of law to each of these claims. Parks also contends that Defendants' conduct renders them liable under Michigan law for defamation and tortious interference with a business relationship; Defendants have also denied liability with respect to these claims. Parks brought this action in a Michigan state court. Defendants subsequently removed the case to the District Court for the Eastern District of Michigan. Following cross-motions for summary judgment, the district court denied Parks' motion for summary judgment and granted summary judgment for Defendants. Parks now appeals the grant of summary judgment for Defendants. For the reasons hereafter set forth, we believe that, with respect to Rosa Parks' claims under the Lanham Act and under the common law right of publicity, "the evidence is such that a reasonable jury could return a verdict for the nonmoving party." Anderson v. Liberty Lobby, Inc., 477 U.S. 242, 248 (1986). We therefore conclude that the district court erred in granting Defendants' motion for summary judgment on those claims. We conclude, however, that the district court properly granted summary judgment in favor of Defendants on Rosa Parks' state law claims of defamation and tortious interference with a business relationship. Rosa Parks is an historical figure who first gained prominence as a symbol of the civil rights movement in the United States during the 1950's and 1960's. In 1955, while riding in the front of a segregated bus in Montgomery, Alabama, she refused to yield her seat to a white passenger and move to the back of the bus as blacks were required to do by the then-existing laws requiring segregation of the races. A 381-day bus boycott in Montgomery flowed from that one event, which eventually became a catalyst for organized boycotts, sit-ins, and demonstrations all across the South. Her single act of defiance has garnered her numerous public accolades and awards, and she has used that celebrity status to promote various civil and human rights causes as well as television programs and books inspired by her life story. She has also approved a collection of gospel recordings by various artists entitled Verity Records Presents: A Tribute to Mrs. Rosa Parks (the "Tribute" album), released in 1995. All yawl can say is them niggas earned that crown but until then . . .